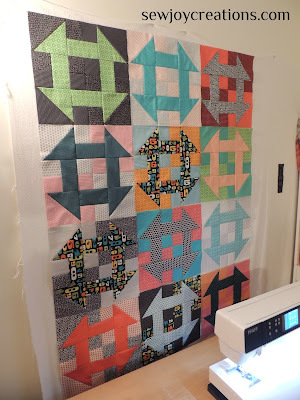 I'm back to share some progress on my Churn, Baby, Churn Dash quilt. 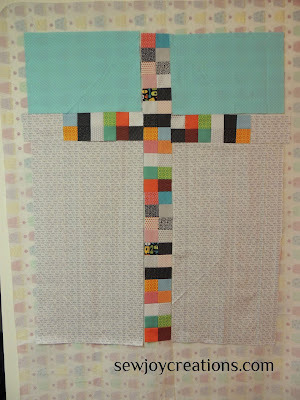 In my last post I showed the fabrics I selected for the churn dashes. 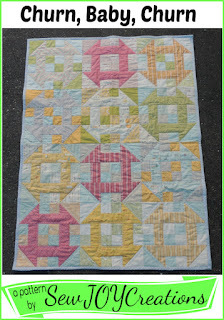 I finally got some deadline quilting done and focused again on this quilt. I spent two, one hour sessions making the last 6 churns I needed. I posted my progress on Instagram where you can see a different arrangement of these blocks. I first laid them out in the same way I had organized my original piles of churn dash and background fabrics - then I walked away. I came back a couple of times, looked at the photo again and made some changes. I really didn't want the colours to read in any particular way, but I did want to spread out the dark backgrounds and the blue churns. I also noticed that I could lay out the blocks so the squares that formed where the blocks joined would each have one light section. After all that thinking and rearranging it was time to sew them together! I'd love to show you a nice "beauty" shot of the top pieced together, but it's Fall here and lately we've had a lot of rainy, overcast days. Plus I've been quilting at night so my inside pictures are pretty dark too. I'm pretty pleased with this design! It came to me as I was walking home from my local quilt store where I bought the text fabric and blue polka dot fabric. The fabric says Teach Them To Sing Teach Them to Care Teach Them To Love etc. - some great fabric for a teacher! Click here for a closer look. I knew I had several two patch units left and I was thinking about ways to incorporate them into the back. I thought about just making a row of them across the quilt and then thought of making it into a cross because my son goes to a Catholic school. My math skills were put to the test in figuring out how to cut my directional text fabric so I would have enough. Remember I said I thought of this on my way HOME from the quilt store - I definitely didn't have enough of the text fabric. The blue I bought for the binding as it matches with the blue in the Uppercase fabrics. Then I was thinking about how this was a quilt for kids and how when they first start drawing pictures of "outside" they make the classic line of sky at the top. I measured the blue fabric and realized I could make two pieces for the top parts and still have some left for binding! This quilt is in hurry up mode as we got a letter home late last week saying that NEXT Monday will be the teacher's last day before her maternity leave. Slight panic here as I am working the next few days then have company this weekend and our little town's Fibre Festival too!